zhongwen.com , Chinese characters and their explanations. Several editions are known from the peoples republic. The latest by New Star is official. One was published in Hong Kong in the time when that city was still under English administration. That one is on a separate page. Asterix is called Yali. For a long time the only official version. Most of the other albums mentioned seem to be bootleg editions. Ake (Asterix). Chengdu is the capital of Sichuan province. 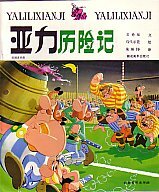 Asiteli lixianji (Asterix' adventures). Anhui is a province. Yali (Asterix). Shandong is a province of China situated between Beijing and Shanghai.